Finished Size 32 (36, 40, 44, 50)" bust circumference. /50 g): #23 deep cerise, 4 (4, 5, 5, 6) skeins. Needles Size 10 (6 mm). Adjust needle size if necessary to obtain the correct gauge. Notions Removable markers (m) or waste yarn; crochet hook in size C/2 (2.75 mm) or D/3 (3.25 mm); tapestry needle. Gauge 16½ sts and 24 rows = 4" in St st.
Sweater shown measures 36", modeled at left with 3" of positive ease. Sucia usually wears a size 8 top. This sweater fit everyone very differently. Sucia liked it, but not with her outfit. She thought it would be great with a black dress or a black shirt and pants. Sizewise, the 36 fit her just right. We loved this top over Terry's gray dress. The 36 fit her just fine, too. The mobius nature of the front of this sweater fits a range of bust sizes, so if you're anywhere from a 34 to a 39, the 36 will fit just fine. Like any garment, though, the fit depends on your body-type. Even though Sucia's bust measurement is one inch smaller than Terry's, Sucia is actually bustier. We thought this top looked just a tad better on the smaller-busted gals because there was more ease and therefore more drapiness. Audrey usually wears a size 12-14 top; she's 5' 2" tall. The sample was just a tad large for Audrey—you can see that the sleeves are too long and there's just too much going on at the waist for the En Point to be really flattering on Audrey's body type. If Audrey were to make this, she should shorten the sleeves to three-quarter-length or at least bracelet-length, and make the size 32. Finished Size 45¼ (49¼,54, 59½, 65¾)" bust circumference. Sweater shown measures 45¼", modeled with several inches of positive ease. Yarn Rowan Lenpur Linen (75% Vilenpur viscose, 25% linen; 126 yd [115 m]/50 g): #561 saffron, 7 (7, 9, 10, 11) balls. Yarn distributed by Westminster Fibers. Needles Ribbing and yoke-size 4 (3.5 mm): 24" circular (cir) and set of double-pointed (dpn). Body-size 6 (4 mm): 24" cir. Adjust needle size if necessary to obtain the correct gauge. Gauge 18 sts and 24 rnds = 4" in St st on larger needle; 22 sts and 32 rnds = 4" in yoke patt st on smaller needle. Sweater shown measures 45¼", modeled at left with several inches of positive ease. The finished sizes for this pattern seem large at first glance. 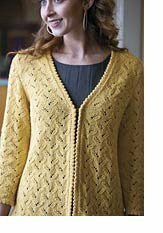 Though these measurements represent the circumference at the hem of the sweater and throughout the body, the smaller gauge and traveling stitches at the yoke force the fabric at the underarm to gather into a functionally smaller circumference, creating a slight A-line shape. When choosing a size to make for this pattern, consider that the functional circumference at the underarm will be approximately 37" (41", 46", 51", 58") for the sizes given, and choose a size that will give you a few inches of positive ease. Dinah usually wears a size 10 top. Sucia's torso is longer than Dinah's, so she would need to add a couple of inches to the length. 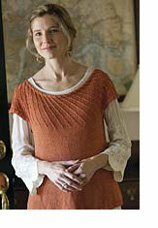 Since this pattern is knit from the top down, she could try it on as she knits and get the top the exact length she likes. This size fit Sucia well except for the length. Audrey usually wears a size 12 top. This was a great look on Audrey. I love how it draws interest up to her bust and face. The sleeves were a perfect length on her, and the top skimmed her hips in a flattering way. It looks perfect with Audrey's black pants, and I think it would look great with a long skirt, too. Finished Size 33 (36, 39¾, 44½, 46¾, 53¾)" bust circumference, with ½" front edgings meeting in center. Yarn Harrisville Designs Silk & Wool (50% silk, 50% wool; 175 yd [160 m]/50 g): #204 pale daffodil, 5 (6, 7, 7, 8, 9) skeins. Needles Body and sleeves-size 6 (4 mm). Edgings-size 4 (3.5 mm): 36" to 40" circular (cir). Adjust needle size if necessary to obtain the correct gauge. Notions Markers (m); tapestry needle; waste yarn; spare cir needle same size or smaller than edging needle; 4 (4, 4, 5, 5, 5) hook-and-eye sets; sharp-point sewing needle and matching thread. Gauge 21 sts and 30 rows = 4" in leaf lace patt on larger needles. Cardigan shown measures 39¾", modeled at left with about 7" ease. Everyone loved this sweater and the talk was all about which yarn would work, what color would look best, and when they were going to start knitting! Dinah thought she'd make the sleeves either a couple inches shorter to make them 3/4-length, or a couple inches longer to make them full length. She also thought she'd make one size larger for a little more wiggle room. (See closure issue described at right.) We all loved the lace pattern. It's lovely and summery. Audrey usually wears a size 12 top; she's 5' 2" tall. Audrey looked so cute in the sample! The sleeves are a good length for her, too. She liked this piece with just one of the hook-and-eyes closed, which is a good option for anyone who knits this sweater. While photographing this gallery, we got into a conversation about how to make this sweater larger or smaller in the bust while keeping the lace pattern intact. One of the gals had the idea to use a larger needle size in the area you want to make larger, which I think is a really interesting idea. I've seen this technique used successfully, so if anyone tries it, let me know! Finished Size 35 (39, 43, 47, 51, 55)" bust circumference. Yarn Mango Moon Dharma (100% recycled silk; 150 yd [137 m]): #9415 wheat, 3 (3, 4, 4, 5, 6) skeins. Needles Size 9 (5.5 mm): straight and set of double-pointed (dpn). Adjust needle size if necessary to obtain the correct gauge. Notions Markers (m); waste yarn; tapestry needle; size 7 (4.5 mm) crochet hook. Gauge 16 sts and 22 rows = 4" in St st; 14 sts and 24 rows = 4" in St st, measured with the fabric held sideways. Vest shown measures 39", modeled at left with 6" of ease. 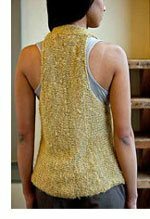 This vest is really neat-o, and the yarn is so soft and unique. All three models have a similar bust size, but this vest looked very different on all of them. Terry, Dinah, and Sucia all thought they might go up to the size 43 so they could close the vest in front more comfortably, but the 39 fit Audrey perfectly. Terry thought she might like the vest closed to emphasize her waist. Dinah liked the vest open and closed, but she wanted a size larger. Sucia thought she might add a button so she could close the vest. It hung off her bust a little to much, and we thought it would be really flattering closed. This was Audrey's favorite—so much so that she ordered yarn and has started knitting! She choose a beautiful cantaloupe color that is so flattering with her skin-tone. I think Audrey and Terry are showing the best ways to wear the Draped Vest: over a monotone outfit. At right is a back view of the vest—pretty cool. Terry usually wears a size 8-10 top. Ready for more? 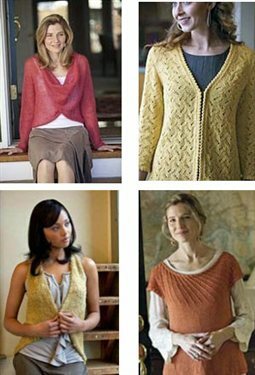 Check out even more tips for customizing knitted sweaters in our spring 2010 Interweave Knits sweater gallery!